Predicting the future is not a glamorous job. The speed of change (some would call it an acceleration) in how we consume media and how technology enables new ways of interaction is so fast, you can’t even predict what would happen in 6 months. However, we have a date about current trends, and at least, we can try to extrapolate that data and make some future predictions of media. Our job as marketers (I deliberately didn’t mention digital marketers) is to continually monitor trends and user behavior, so we can be prepared for what’s coming. Our clients depend on us to give them advice on the future of advertising. They need partners to constantly question the old way of doing things. The media industry is changing really fast, and it is going to change even faster. In this series of blog posts, we are going to discuss the future of media and advertising industry by looking at the shift in consumers’ behavior. 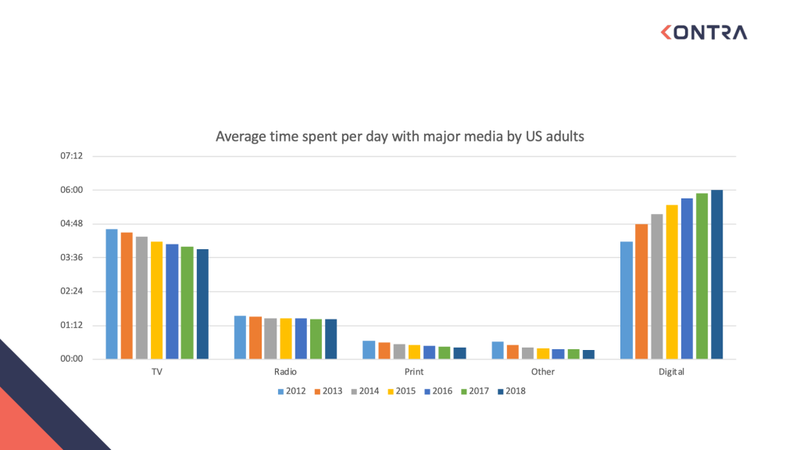 Thanks to eMarketer, we can see the shift in the way US adults use major media. 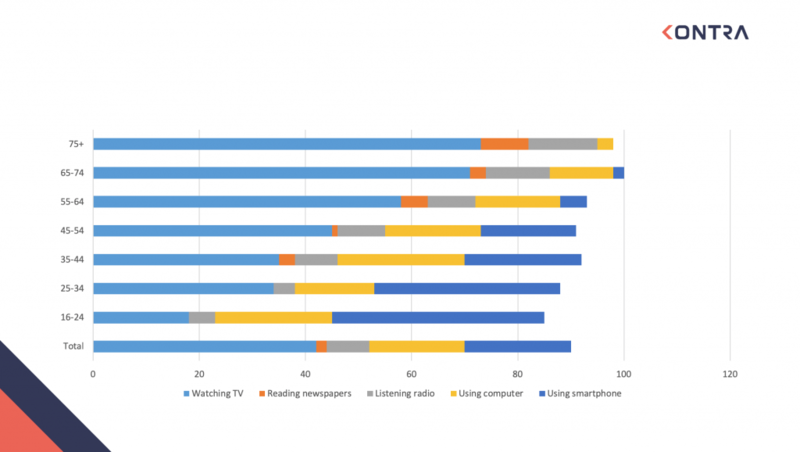 What we see around us is quite simple: older people mostly use traditional media while millennials (actually most people under 40) mostly use digital media. Now please try to imagine what will happen in 10 years, when all these young users become the majority of media consumers. Moreover, in the next blog posts, we will explain why and how all these traditional channels will eventually become digital channels. According to eMarketer, we can see that in 2018 digital ad spending reached 43.5% of all spending, but it will overtake traditional mediums by 2021. When I see this data, I try to extrapolate what will happen in the future, and I see something. Maybe we shouldn’t call Kontra a digital agency. In the future, there won’t be an agency which is not digital. Trends are here, ladies and gentleman. We see changes every day; we change every day. Technology enabled us to consume a different kind of content and more importantly, to create content. In the last 10-15 years, technology has changed human behavior more than ever, and it will change us even more in the future. By changing our way of consuming content, it will change traditional media as well. In the next posts, we’ll discuss the future of print, TV, and radio. Stay tuned.